Mom and I have been reading about the Clam Box in Ipswich, MA, for years. The reviews of the seafood were outstanding, not to mention the restaurant itself was shaped like an actual clam box. We just love stuff like that! 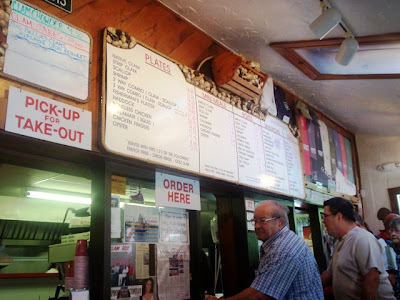 When planning our vacation, Mom suggested that we finally pay a visit to this 60 year old establishment and see for ourselves what Bostonians have been raving about. After driving for quite a while, we pulled into the parking area at around 12:30 p.m.
For an early Thursday afternoon, the parking lot was quite full. In fact, there was a line of people standing outside waiting to get into the building. Mom had read that this happens quite often, and during the summer months, you can barely get near the place. Luckily, the line was moving fast and after about 10 minutes, we found ourselves in front of the ordering window and reading the large menu on the wall. We also had to make way for all the elderly people that were swarming the place. Apparently Clam Box is a hit with the over-sixties. After pushing our way through all the walkers and canes, we were finally able to place our order. Since Mom and I like to plan ahead, we already knew what we wanted to get. A cute young man came over to take our order. 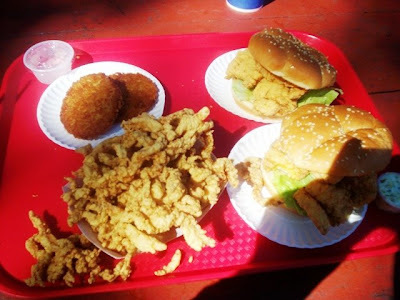 I chose two haddock fillet sandwiches ($7.50 each), a small box of clam strips ($8.75), and two clam cakes ($1 each). I also ordered two diet sodas and a novelty magnet that featured a pretty picture of the Clam Box restaurant ($2.50). The food and beverage total came to approximately $30 and change. I couldn't write down the exact total nor even remember my name because it was so loud and frenzied in there. However, it was a lot of fun. 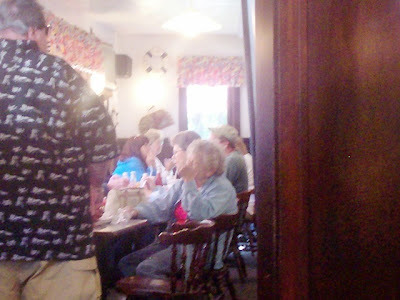 As we sat on the bench waiting for our food (we were given a number), Mom decided to peek into the tiny dining room. WOW! It was packed. We decided that when our food was ready, we would take it outside and eat at one of the picnic tables. After only a few minutes of waiting, one of the workers behind the counter called our number. I grabbed a few condiments (tartar sauce and vinegar) while Mom grabbed the napkins and straws. We carefully made our way through the door and through the gravel parking lot. It was a blessing that I didn't drop the sodas. When we got to the table, we set everything up. The food looked and smelled delicious. After swatting away some nearby bees, we dug into our lunch. The haddock fillet sandwiches were amazing. Mom said that she's had fried haddock sandwiches in several different places, but this was by far the best. I completely agree. The sandwiches were chock full of flaky, white fish. The coating was very light and dry, making it easy to taste the delicious fish inside. Although $7.50 may be a lot for someone to spend on one sandwich, you certainly get your money's worth because this sandwich was extremely meaty and filling. Even the bun was big, soft, and fresh. This was definitely an A+ dish. The clam cakes weren't really cakes at all. They were little flat patties. Mom and I had never had them like this. The "cakes" were deep fried until crispy, and they kept that delicious clam taste. The crust was also nicely spiced, which helped give the cakes a great flavor. This was a really unique way of making clam cakes, but Mom and I loved them. The clam strips - like the fillets - were the best we've had so far. They had the same nice, dry coating as the haddock, and were very fresh, clean, and sweet. Both Mom and I can see why Clam Box has been an institution for years. Since we had some strips leftover, we decided to put them in our freezer bag to see if they'd save until we got back home. Dad was brave enough to try them after they'd been in the car for a while, and he said that they heated up very well and were excellent. As Mom and I were packing up to leave, a large bus filled with golden agers pulled into the parking lot. 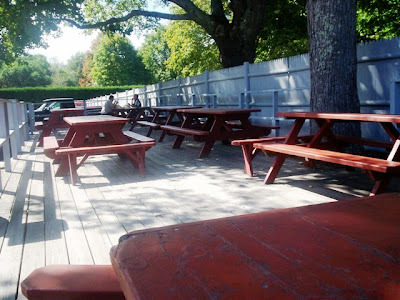 As the staff were setting up the outdoor picnic tables ('cause there wasn't any room in the dining room for all those biddies), Mom and I joked about how we like to come to places that the older crowds frequent. Older people have been around a long time. They certainly know where to get a good meal for a good price, and that's exactly what Mom and I got at the Clam Box. It was by far some of the best seafood we've ever eaten. Be sure to pick up a magnet or a t-shirt on your way out. You're going to want to remember your meal for a very long time. 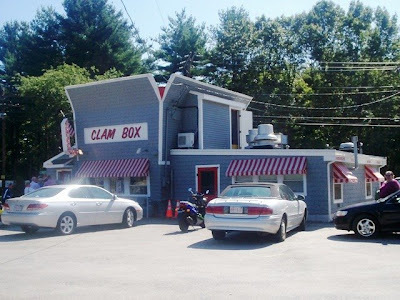 The Clam Box summer hours are from 11 a.m. to 8 p.m. daily (except Tuesday). Since their hours vary, please call before making the long drive to Ipswich. I believe they may be open year round.